Lock in a great price for Las Palmas Maya – rated 8.6 by recent guests! Extremely friendly, and helpful staff. The breakfast was amazing! Very friendly and outgoing staff. The owner was almost overly nice. Maybe to make up for the lack of everything else on the property. Tom the manager is amazing! Very helpful and explains everything in detail! Very accommodating! You can eat delicious breakfast there prepared fresh and very tasty. I only wish the rooms had AC. In July the rooms are sooooo hot but Tom gave us an extra fan and that worked fine! The rooms are very clean and spacious! Super cute and quaint decor throughout! The staff is very kind! I will definitely come back!!!! They keep the grounds very clean and beautiful ... there is also full kitchen facilities where you can cook. Staff was very friendly and spoke fluent English. Community kitchen was super convienent with fridge and filtered water. Water pressure and constant hot temperature was surprising considering how eco-friendly the hotel is. Great location and easy to access the beach right across the road at Om! Really cool cabanas with a nice outdoor area. Staff is very friendly! Tom the owner of the property was amazing! Helped us out with everything we needed! The hotel site was so much different than what I'm used to in a good way. It was nice to step into simplicity at its best! The bed was suuuuper comfortable, the coffee was delicious, and the overall vibe was great. Tom was so helpful, he gave us great recommendations, he was really nice, made us feel at home. Basic accommodation but very clean and comfortable. Excellent location for the price. Owner is friendly and helpful with good recommendations and always available. Communal kitchen available to cook or store food is very handy. Hot water and good water pressure was appreciated. 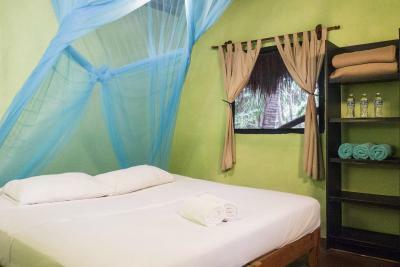 Located in Tulum, within 7 miles of Tulum Archeological Site and 1.6 miles of Cesiak, Las Palmas Maya provides accommodations with free WiFi. 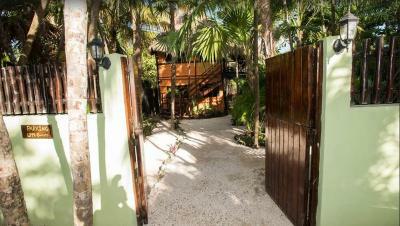 Offering a garden, the property is located within 2.9 miles of Parque Nacional Tulum. The tour desk is available to assist guests in planning their days out. Guest rooms at the hotel come with a seating area. 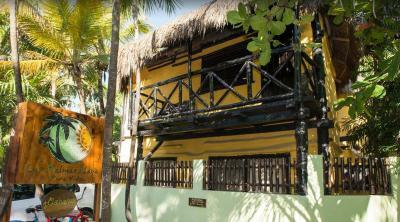 All rooms are equipped with air conditioning, and selected rooms also feature a balcony. The rooms at Las Palmas Maya are equipped with a private bathroom equipped with a shower. Guests at the accommodation will be able to enjoy activities in and around Tulum, like cycling. Tulum Bus station is 6 miles from Las Palmas Maya, while Bus station Tulum Ruins is 7 miles away. 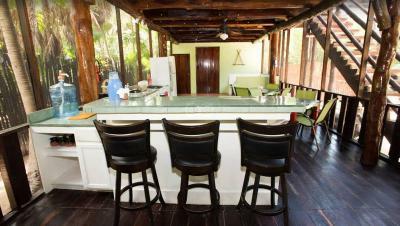 The nearest airport is Cozumel Airport, 54 miles from the property. 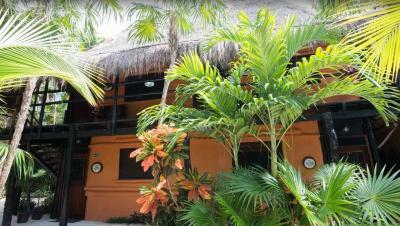 When would you like to stay at Las Palmas Maya? This double room has a patio, tile/marble floor and seating area. This triple room features a balcony, seating area and private entrance. This suite has a sofa, tile/marble floor and seating area. This suite features a balcony, view and private entrance. House Rules Las Palmas Maya takes special requests – add in the next step! Las Palmas Maya accepts these cards and reserves the right to temporarily hold an amount prior to arrival. Great location opposite a great stretch of beach. Lovely clean rooms. Mosquito net over the bed and 2 fans. There is A/C being installed but the fans were sufficient for us. There is an shared kitchen if you want to store food in a fridge or cook meals and early morning coffee is prepared by the staff and available here. A delicious breakfast is served out front and all the staff are very friendly and helpful. Tom the manager could not have been more helpful sorting out our car hire and airport transfer problems, organising a tour to the Sian Ka'an reserve and generally giving us tips on restaurants and other activities. I have nothing negative to report about Las Palmas Maya. Tulum was probably the least favourite of all the places I visited during my month-long stay in Mexico. I really hate what is happening to it with all the unbridled development. 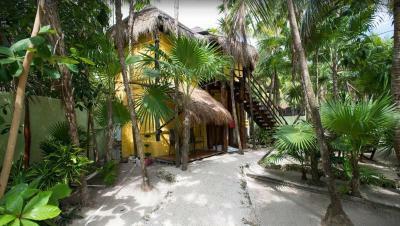 It’s an ecological disaster unfolding like a slow-motion train wreck..
Palmas Maya Tulum Good value for money in Tulum. Tulum is in a state of rampant, uncontrolled development, especially along the beach strip, hence all the generators, construction workers, traffic and general air of chaos. 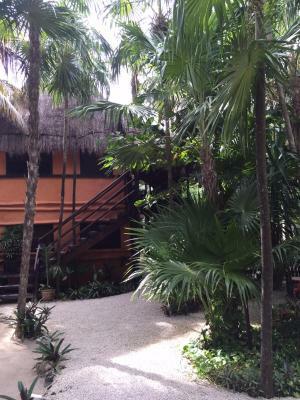 Las Palmas Maya is an affordable (relative to other properties along the beach) oasis amidst this madness. It’s not quite ocean-front, but you can walk to the beach in under a minute (through another property), and the beach is truly spectacular. 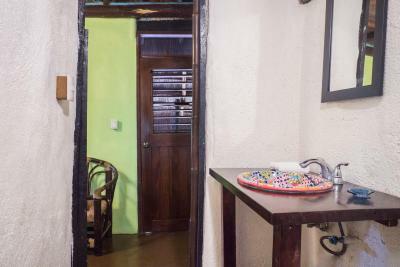 The property itself is quite small, and has a charming, almost youth-hostel vibe. The owner, Tom (a fluent English-speaker), is eager to give every guest the best experience possible, and is a fount of travel tips and local knowledge. There is a large, airy communal kitchen you can use to store and prepare your food. Our room was romantic, comfortable, and clean. Parking was limited, but Tom made sure we got a spot. The location is great, the shower is excellent, the room was very clean and the bed was comfortable. Tom was really helpful with all of the questions we had and recommending the best spots around the area. The place needs to be updated. Was cheaper than most places but definitely not worth what I paid. ($1k for 4 nights after taxes and fees) Rusty faucets and shower, and It was really muggy and gross. The fan they provided kept breaking according to them because it was so muggy and the moisture caused the issue. LOTS of different bugs and insects in the room and shower most likely because there was no seal between the door and outside. No closets, just 3 chairs that you can’t sit in because they were all ripped and had holes through the bottoms. Walls are paper thin so you hear everyone else on the property or in the building. Water from shower and sink were not filtered so smelled like sulfur/salt. Basically felt like I was camping in a tent only it was larger than a tent with walls, a toilet, sink and a shower. Couldn’t cancel or get refunded and it really ruined my trip so I ended up booking another hotel and moved out after a couple nights and paid for both places. Definitely would never stay there again. Hate to write a bad review since the staff was so nice and maybe they’re just trying to make it but this place needs a revamp. Other should know before they’re out the $1k plus what they have to spend on another hotel to get through your trip... unless you like the rugged outdoors and just need shelter from rain. Overpriced. Just don't bother. 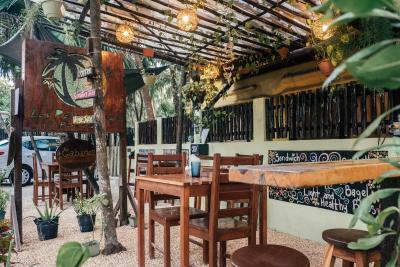 If you visit Tulum stay in Tulum town. Forget the beachside. It's ridiculously overpriced and a building site. As it has been said in other reviews, Tom was really helpful and gave us lots of local tips (it’s quite hard to avoid the tourist rip off on that strip by the beach!). The room had everything we needed and was always kept clean. It was just across the road from the beach which was great. You can cycle to town but it was a bit further than we expected as not regular cyclists! Lots of bars and restaurants within easy walking distance though so you don’t really need to go anyway if you’re after a beach holiday! It would be nice if there was a wardrobe to put your clothes in. Just a shelf and a few hooks on the wall. The rooms were cleaned everyday, it was like magic, I would pop out for a couple of minutes then would return to a clean room with the beds made ! The couple that runs this hotel are extremely friendly and were always up for a chat. Don't forget to try the amazing coffee they have too! Tom was an absolutely brilliant host and made us feel incredibly welcome. Helped us out a lot and would recommend his place to anyone. The hotel is almost at the end of the road parallel to the beach, opposite to the ruins. A lot of traffic to get here, quite exahusting. No swimming pool, no beach position, which was ok for us but could be a minus for someone else. The room is very nice and price good with applied discount. At full price, it would be a bit expensive. Manager really helpful and friendly. Several good restaurants within walking distance. To get to the beach one has to cross other properties like hotels or beach bars. To use sun chairs during the day one has to pay 15 dollars and up to these properties... That's insane! There's no public beach close. 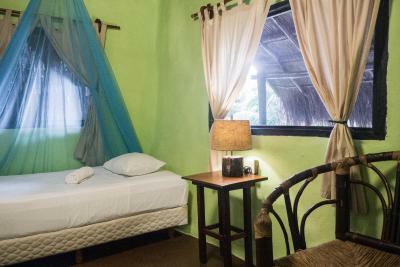 The hostal is located only a five minute walk from the beach. It's a calm and clean space. The bed even has moskito nets. The host Tom is really nice and can give lots of advice. The other staff members are really nice as well. The hostal even rents out bikes. A big plus is the big kitchen in the main building, where one can prepare own meals. This saved us a lot of money in the overly overpriced Tulum beach area. Don't get me wrong, the beach is amazing! But we didn't enjoy the "rest" of Tulum beach area so much.